· Strong Stainless Steel tubular Frame Work. - SS Tubular Frame Work and SS sheet top with high boarder. - Provision for drainage hole, SS bucket. 1. Dimension – 260x80x90cm. (LxBxH). 2. Pedestal type table made of S.S. 304 grade. Dissecting Table Frame work constructed with 304 grade stainless steel 16 gauge material. Top is constructed with 18 gauge 304 grade stainless steel sheet, with high boarder. Provision for drainer hole with tube for waste liquid. Provision for Keeping SS bucket under the Top surface. Jindal dissection tables with dip tank are uniquely designed for the safe, prolonged storage & dissection of the cadaver. · Top is covered with SS Sheet, with Centre Slope In cross Form. · Provision of Drainage Hole connected with Waste water outlet Pipe. - Frame work constructed with stainless steel material. 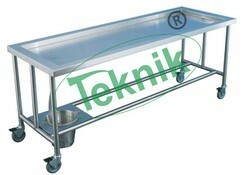 - Top is constructed with stainless steel sheet, with high boarder. - Provision for drainer hole with tube for waste liquid. - Strong Mild Steel tubular Frame Work. - Top is covered with SS Sheet, with Centre Slope. - Drainage Hole connected with Waste water outlet Pipe. Provision of SS Bucket and removable Hand rest. - Mounted on Rubber Stumps. Size: - 73L x 24W x 36 H.
- Pre Treated and epoxy Powder coated finishing. · These Dissection Table has Strong Stainless Steel tubular Frame Work. · Top of these Dissection Table is covered with SS Sheet, with Centre Slope In cross Form. 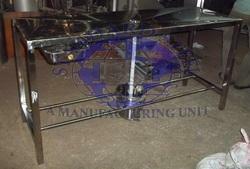 Our company has created a niche in the field of offering Dissection Table. · Provision of SS Bucket and Sliding Tray. Apzem Offers the complete range of Small to Large Animal Necropsy Dissection Tables.Surgical and Necropsy Station is designed for necropsy and small animal surgical procedures.